In the FirstEnergy Muscle Car Challenge, TA2 defending champion Tony Buffomante, in the No. 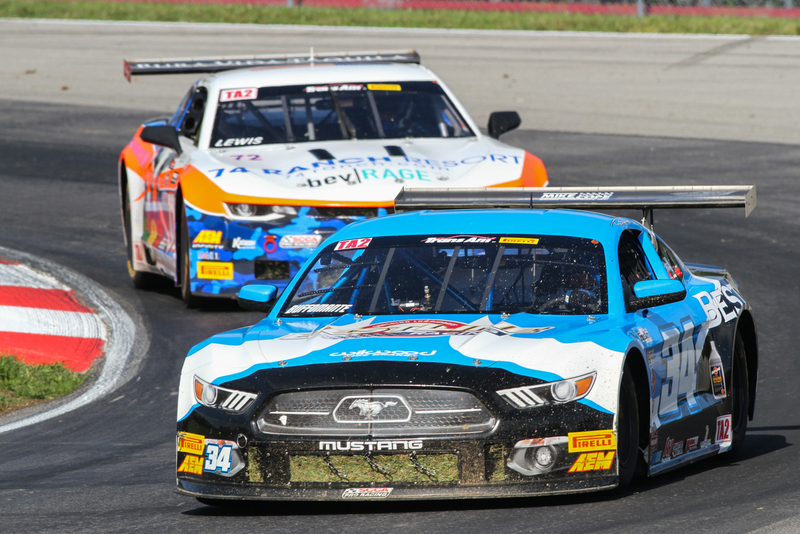 34 Best Line Superior Lubricants Ford Mustang, captured his third victory of the year and second consecutive, finally securing the Mid-Ohio victory that had previously eluded him throughout his TA2 career. After a canceled qualifying the day before, Buffomante started fourth on a grid set by points and spent much of the race in a three-way battle with Dillon Machavern, in the No. 24 Heritage Motorsports Ford Mustang, and current points leader and pole-sitter Gar Robinson, in the No. 74 Pura Vida Tequila, 74 Ranch Resort Chevrolet Camaro. The pivotal moment came on the second of three restarts, with Buffomante overtaking both Machavern and Robinson through the first few turns. Gar Robinson would finish second comfortably and was followed across the finish line by Cameron Lawrence, who provisionally finished third. However, following technical inspection the No. 19 Class Auto Centers Chevrolet Camaro of Lawrence was excluded from the results for a technical infraction, Article 14.4.2, roof height. Shane Lewis, in the No. 72 Pura Vida Tequila/ 74 Ranch Resort Chevrolet Camaro, would inherit third for his sixth podium finish of the year after battling back from a spin on lap 19 that saw him fall back to 15th position. Lawrence Loshak, in the No. 5 Pennzoil/ ETE Reman Chevrolet Camaro, was awarded fourth while Rafa Matos, in his second Trans Am appearance in the No. 88 3-Dimensional Services Group Chevrolet Camaro, completed the top five. Dillon Machavern, who ran the first half of the race in the top three and tied Buffomante for most laps led, would suffer a mechanical failure on lap 33, marking the second event in a row the No. 24’s race has been cut short by mechanical issues. Buffomante’s pass on the restart would be awarded the COOLSHIRT Systems Cool Move of the Race; the No.34 of Buffomante also set the fast lap of the race, a 1:25.210, a new track record eclipsing the previous record of 1:26.889 set by Lawrence Loshak last year. The Trans Am Series presented by Pirelli will return to action next at Road America for Round 8 of the Trans Am Championship on August 26th.